During our visit to Morocco we briefly visited the capital city, Rabat. One of the features of our short stay was a visit to the ancient Roman ruins of Sala Colonia. These old ruins were fascinating and the oldest historic buildings my wife and I had ever seen, though that was to change in the coming weeks. From a birding point of view there were a few birds around but my main interest was in looking at the ruins and listening to our guide. The most prominent birds present were quite a number of White Storks on their nests, always perched on a high vantage spot. White Storks are large birds, measuring over a metre in height and with a wingspan of about two metres. 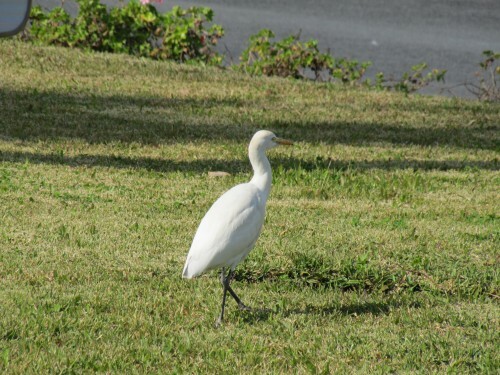 Their prominent red bills and red legs stand out against their mostly white feathers – there is some black on the wings. 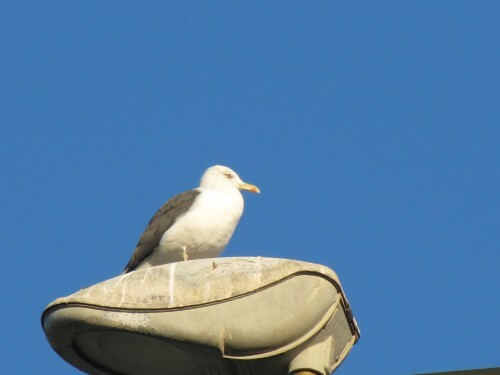 This was a new species for me and a delight to see, though it would be a common sight not only in Morocco but in many parts of Africa, Europe and even south western Asia. The massive nests are not easily overlooked either. 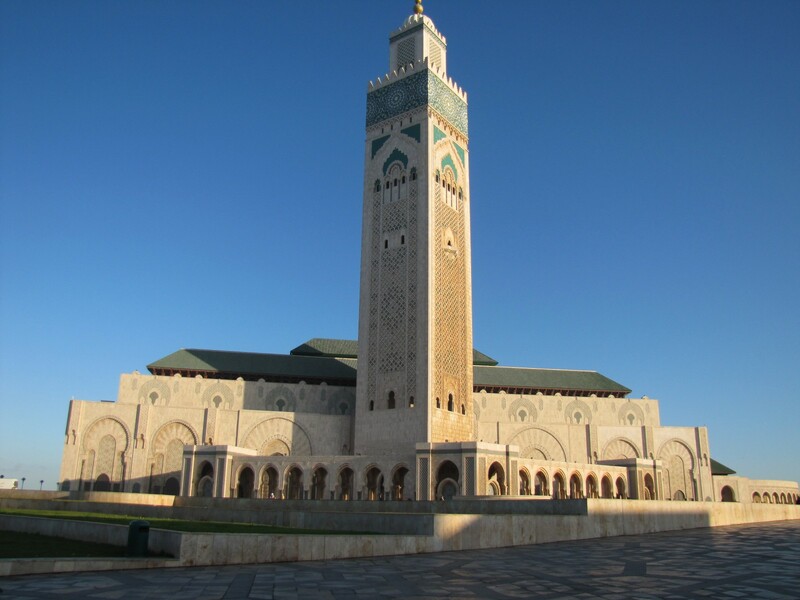 On our first day in Morocco we visited the beautiful Hassan II Mosque in Casablanca. I’ve written extensively about this magnificent building and shown many photos of it on Trevor’s Travels. Like most city buildings in large cities, this one is not exempt from the mess made by Rock Doves. 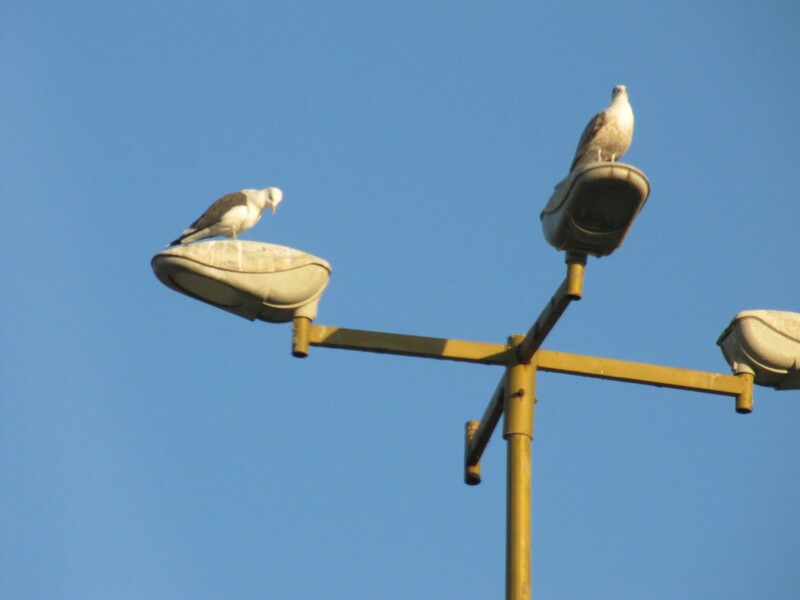 I can’t recall a city I visited where these messy pigeons have not been present, often in large numbers. In Kathmandu, Nepal, two of them even took aim and made a deposit on my hat, both within an hour of each other. The magnificent mosque in Casablanca sadly has its own resident population of feral pigeons, leaving a terrible mess by their presence – see the photo below. 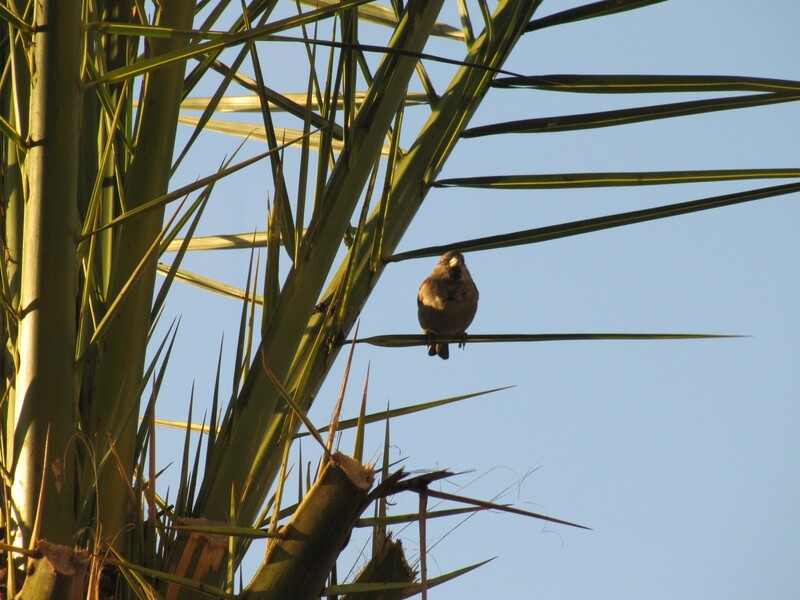 Just as we were leaving our hotel in Casablanca on our visit there last year, I saw this bird in a tree across the road. A quick snap before getting on the bus was all I could achieve, not even time to get out the binoculars. I suspect it is a female House Sparrow; it certainly looks like one. The species is quite common in many parts of Morocco, so I am fairly confident that is what it is. If any of my readers has more experience of the birds of Morocco than me, or if you disagree with my ID, please leave a comment. I could have enlarged the image digitally, but the result would prove to be too blurry to be helpful. I will post more about Moroccan birds in the coming days. Update: March 1st, 2016: one of my readers has confirmed this as a House Sparrow – but a male. On looking again at the photo, I would have to agree. It has been a few months since I shared some of the bird photos I took while on a six week overseas holiday a year ago. I’ve already shown the bird photos I took in Ethiopia when we were visiting our daughter. To see these photos, go to the Archives of this site and scroll down the page until you get to the posts about Ethiopia. After our stay in Ethiopia we flew to Morocco via Cairo for a two week tour of the country. This was primarily a cultural tour, so the opportunities for serious birding were very limited. I took every opportunity to get a few bird photos along the way, as time and circumstances allowed. On our first morning in Casablanca we visited the enormous and beautiful Hassan II Mosque, shown in the photo above. You can see more photos of this wonderful building on my other site, Trevor’s Travels. 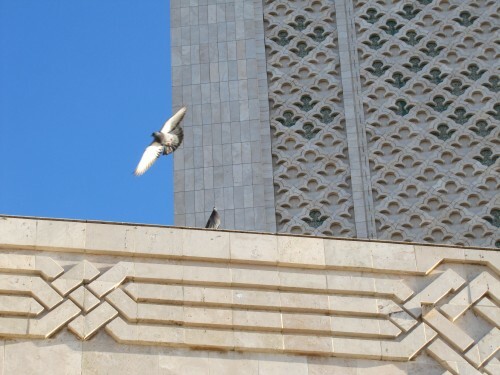 While we were waiting outside for our guided tour of the mosque, I noticed a few bird species flying around, or perching as in the photos below. 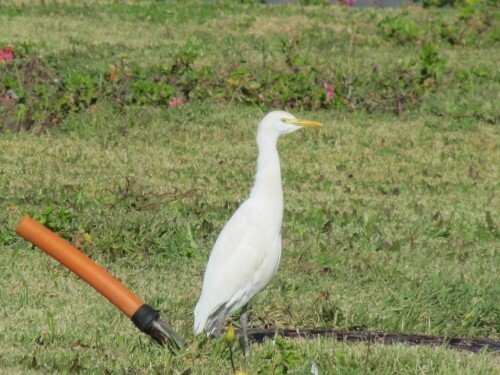 I managed to identify Cattle Egret, Rock Dove (many around the mosque), Common Starling, Common Blackbird and what I think is Yellow-legged Gull. I don’t have a bird guide to the birds of Morocco, so I’ve had to rely on online resources. 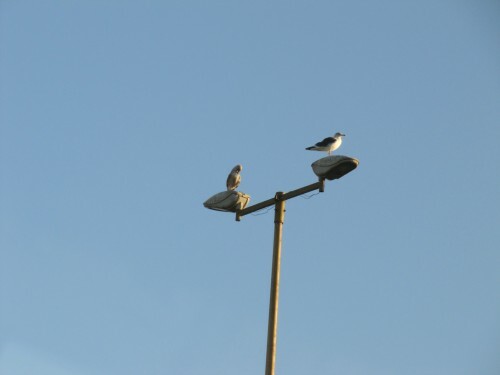 If any more experienced birder can identify these birds correctly, please let me know in the comments. I apologise for the poor quality of the photos. You are currently browsing the Trevor's Birding blog archives for January, 2013.